Critical Animal: Ancient Chaosmos: In Defense of the Sophists, part 2. 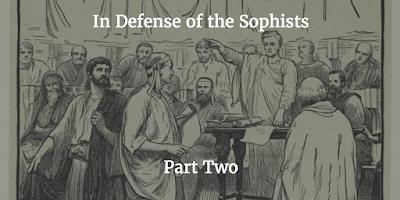 Ancient Chaosmos: In Defense of the Sophists, part 2. Remember what has been already said, that to the sick man his food appears to be and is bitter, and to the man in health the opposite of bitter. Now I cannot conceive that one of these men can be or ought to be made wiser than the other: nor can you assert that the sick man because he has one impression is foolish, and the healthy man because he has another is wise; but the one state requires to be changed into the other, the worse into the better. As in education, a change of state has to be effected, and the sophist accomplishes by words the change which the physician works by the aid of drugs (emphasis added). Not all arguments that begin off weak are false, and it is the pedagogical duty to, like the physician, help make weak arguments into stronger ones. As Gagarin points out, "The weaker logos sometimes turns out to be the just logos" (p. 26). Sometimes it is the logos that is seen as absurd and unhearable that most needs to be turned stronger in order for justice to occur. But, you may be asking, didn't the sophists still, as Aristotle argued, train their students in the art of eristic? Eristic, as Wikipedia informs us, can be glossed as in "philosophy and rhetoric, eristic (from Eris, the ancient Greek goddess of chaos, strife, and discord) refers to argument that aims to successfully dispute another's argument, rather than searching for truth." What we have here, as Kerferd argues in The Sophistic Movement, is a relationship between eristic, antilogic (or antilogy), and dialectic. The dialectic of Plato and Aristotle is the method, whatever differences there may be, that they both support for the discovery of truth. Antilogy (which, following Gagarin, we are using to gloss Antilogiai) is the method of bringing opposing logoi on the same issue together. Antilogy is a key strategy of the sophists, reflecting Protagoras' statement that "there are two logoi on every subject opposed to one another." Now, neither Plato nor Aristotle were opposed to antilogy, they both saw it as an important part of the dialectic. The problem, however, was that the sophists refused the dialectic, and thus Plato, Xenophon, and Aristotle all come to see the sophistic antilogy as key to the eristic; in other words antilogy divorced from the dialectic and therefore divorced from truth. But if the sophists were so interested in winning arguments, why did they refuse to push the antilogy into the dialectic? As Michael Gagarin asks in his article of the same name, did the sophists aim to persuade? Less obvious as an antilogy, perhaps, is a logos attributed to the supposed inventors of rhetoric, Corax and Tisias (who were mentioned brie􏰝y above), the only logos of theirs that is likely to be authentic. In Aristotle’s version (Rhetoric 2.24.11, 1402a17–28), which he attributes to Corax, after a fi􏰜ght between a weak man and a strong man, the weak man gives a probability argument to the effect that it is not likely that he, a weak man, assaulted a strong man; the other replies with a reverse probability argument, that he is not likely to have assaulted a weak man, since he, a strong man, would immediately be suspected of the crime. In other words, because he was likely to do it, he was therefore unlikely to do it (Gagarin, "Did the Sophists..." p. 282). Such an argument, as Gagarin explains, is less persuasive, and something more like a paradox of Zeno's. Gagarin's point is that the sophists were less interested in strict persuasion, but more in pleasure, delight, and even truth. Much like a paradox from Zeno. I would make another point about the antilogy, one tied into the shared pedagogical focus of the sophists and current professors. When I teach my Moral Philosophy class, I often proceed through a series of antilogies (assuming that an issue can have more than two sides). So when I teach Kant, I want my students to become Kantians. And when we then to turn to Mill, I want my students to become utilitarians. I try to provide the strongest argument for each of the thinkers we explore. I do not, actually, have any desire for the students leaving my classroom to be Kantians or utilitarians. But nor am I practicing a classroom dialectic where I hope that at the end of the class, we have all come to agree about the shared truth of moral philosophy. Rather, what I am teaching by staying in the antilogy is euboulia, good judgement or deliberating well. In other words, exactly what Protagoras claims to be teaching in his dialogue by Plato. I am not hoping that students leaving my classroom merely have a better understanding of Kant or Mill or Held, but rather that they are able to think (as understood by Arendt and Deleuze). But in what way is thinking allied with the truth? That single, dominant path of ontology goes from Parmendies to Plato via a certain reading of Aristotle up to Heidegger. [...] I found a very simple model and countermodel, perhaps also a little caricaturish. The model is Parmenides’s Poem and Platonico-Aristotelian ontology, and the countermodel is the sophistic. Parmenidean ontology is wonderfully analyzed by Heidegger. He shows the connection, the cobelonging between being and speaking: to speak is to speak Being. To be, to think and to say are one and the same. That leads directly to Unterwegs zur Sprache (On the Way to Language) and to the way in which a human being is entrusted with the “Being There” (Dasein) who will speak Being. The countermodel, I no longer call it ontology but “logology,” to take up the term Novalis used to refer to discourse insofar as it is primarily concerned with itself. Sophistics is that second type of logos. (pp. 9-12). It is hard not to immediately contrast Parmendies' On Nature with Gorgias provocative work On Non-Being. Also worth remembering is that Protagoras claimed to not know if the gods existed, and furthermore, famously contended that "Man is the measure of all things: of the things that are, that they are, of the things that are not, that they are not." This could be a position of relativism, but is also, undoubtedly, a position of pluralism. Protagoras seems to be arguing for some sort of ontological and existential pluralism. It is for this position that, as Cassin reminds us, Aristotle specifically excludes the sophist from intelligibility in his Metaphysics, because the sophist violates the principle of noncontradiction. The sophistic position is closer to radical empiricism and Jamesian pragmatism than it is to Platonic Truth. 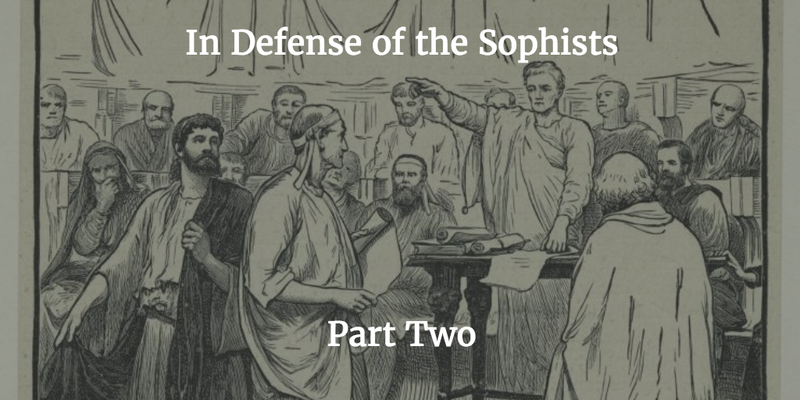 If, as the X-Files tell us, the Truth is out there, and all we need is the dialectic to discover it, the sophists are an obvious threat, and rhetoric and philosophy stand opposed. However, if truth is complicated, perhaps even plural, and if in order to find the truth we have to hear the unhearable and see the unseeable, then rhetoric becomes an essential element of aisthesis and philosophy. likely to give rise to dispute, of subjects able to articulate it. It produces both new inscriptions of equality within liberty and a fresh sphere of visibility for further demonstrations. Politics is not made up of power relationships; it is made up of relationships between worlds (Ranciere, Disagreement, p. 42, emphasis added). This is perhaps what Deleuze understood in his own discussion of the sophists in his essay, "The Simulcrum and Ancient Philosophy." Against Platonic hierarchy, the sophists introduce a kind of chaos at the heart of representation. "There is a point where Joyce is Nietzschean when he shows that the vicus of recirculation can not affect and cause a 'choasmos' to revolve. To the coherence of representation, the eternal return substitutes something else entirely--its own chaodyssey (chao-errance)" (p. 264). Against the ontology of Parmendies the sophists introduce an ancient chaosmos. And perhaps then the sophists did practice eristic. Not in the sense as above, but as a discourse of chaos and incommensurability, where the unresolved antilogy seeks to provide us with the good judgement to live together when we must navigate the truth of the worlds. One last point, of a far too long blog post. Recently my friend Joseph Trullinger has sought to distinguish between philosophers, the friends of wisdom, and philonikers, the friends of victory. Even if you think the sophists have it all wrong, I hope, at least, that you might take them seriously as philosophers engaged in an egalitarian pedagogy and a project of truth. But that means we might need a term for those who seek to undermine philosophical discussion by appearing too clever, by advancing needless arguments, and various other issues. Perhaps (though unlikely) Trullinger's philoniker might catch on in place of the sophist. If nothing else, Trullinger makes it clear that we are all occasionally a philoniker. Which is important, because the philoniker is not some outside threat, not another charlatan movement that needs to be unmasked (like the moves against Derrida and Butler), but is rather a tendency we are all susceptible to, and we must all work against. Our dismissal of the sophists have always provided us with an easy insult to steal the ethos of our philosophical rivals, and justify our refusal to take them seriously. Philoniker seems to gesture toward some shared issue, and therefore reflects an egalitarianism that I think many sophists would approve of.